Brecciated Jasper: Wow! This is some of the nicest we have seen. A great rough for rock tumbling. This photo shows some of our rough brecciated jasper. The rough in the photo above is wet to show full color. This is one of the nicest materials that I have tumbled in a long time. 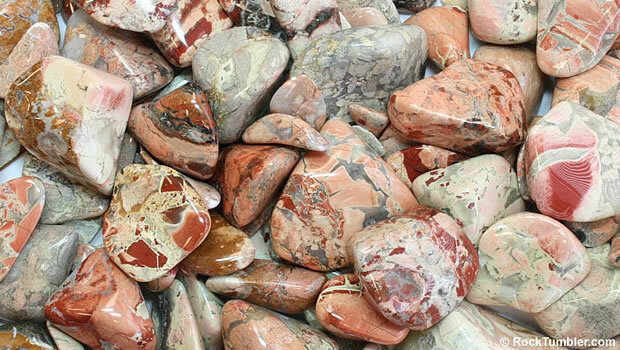 It is a brecciated jasper with a wide range of colors. A "breccia" is a rock that contains angular pieces that have been cemented together to form a solid mass. The breccia fragments in this material range from tan to pink through gray. They have been cemented together with a translucent white to gray agate. The result is a wonderful blend of diverse color. This mix is perfect for the beginner. It rounds nicely in the tumbler and accepts an brilliant polish with TXP aluminum oxide polish. It has a range of particle sizes from about 3/8" (9 mm) to 1 1/2" (38 mm) and requires little to no preparation. 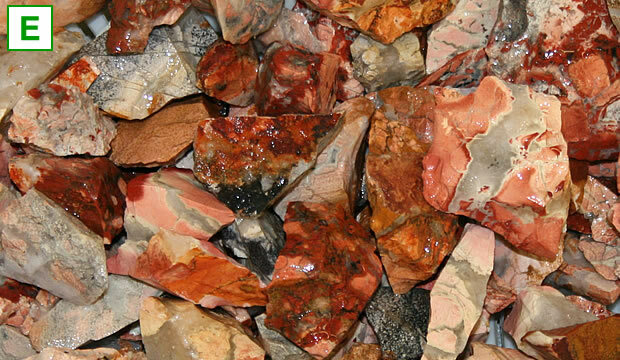 This brecciated jasper has been crushed and sized to perform well in small rotary tumblers such as the Thumler's MP-1, A-R1, and A-R2. The size range gives the material a good tumbling action and eliminates the need for ceramic media. Our EASY Rock Tumbling Recipe works well for rough that has a Mohs hardness of 7 and has been crushed to a variety of particle sizes under about 1 1/2 inches.